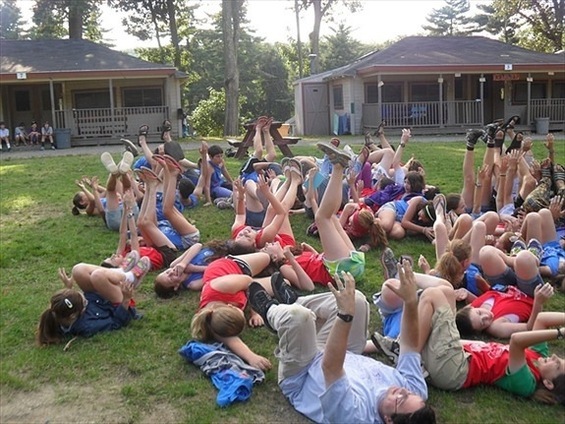 A lot of the campers at Camp Ramah in New England like to joke about how they live “ten months for two.” That is, they find a way to get through the ten months of the year, so that they can make it to those two special months of the summer when they can be at camp. We laugh about that, but we also take that point of view very seriously! We work hard to find ways to keep our hanichim (campers) and horim (parents) involved with Ramah year-round. We run Ramah reunions around our region. (Coming up in March, we’ll be hosting a “Purim in Palmer” reunion weekend for our older campers, in which we’ll have a fun, crazy time celebrating hag Purim all together at camp!) Our Tikvah Program for children with special needs has hosted a number of get-togethers and special programs, and as you read this a group of our Tikvah participants and staff-members are traveling around Israel together on a special Ramah Tikvah tiyul (trip) across Israel! We organize a “Wear Your Ramah T-Shirt Day” in which Ramahniks across the country can show their camp pride by wearing their favorite Ramah gear to school or work. (See photo!) We keep our kids and families engaged using facebook and other forms of social media, sharing photos and memories with one another. And on and on. While it’s important to us to maintain in our campers a connection to Ramah and to their wonderful camp friends, it’s also critical that our kids maintain a connection to the Jewish experiences that were so central a part of the time they spent at camp. While we love our kids’ fervent “ten for two” enthusiasm for the experiences they have over the summer at Camp Ramah, we don’t want the time they spend at camp to be the be-all and end-all of their Jewish experiences during the year. Our hope is that the powerful, joyous Jewish experiences that our hanichim (campers) have at Ramah will inspire them to continue those experiences during the year. Much of what we do at camp over the summer is geared towards the rest of the year, when our kids will not be all together at camp. We want kids to have a wonderful t’fillah experience at camp, but we also want them to build the skills and develop a comfort level with t’fillot that will enable them to participate in t’fillot at their home synagogue. (And have the desire to do so!) We focus on the experiences we share together at camp (on Shabbat, on Rosh Chodesh, on Tisha B’av), while also spending time teaching our campers about the rest of the Jewish calendar. (Below is a photo of a group of our kids re-enacting the cattle plague for a special Pesach video that we’ll be sharing with our community when Pesach arrives!) During the year, we run Ramah Shabbat programs at many of the synagogues in our regions, bringing a taste of the Ramah flavor into our communities, and giving our Ramah kids a chance to sing their hearts out just the way they love to do at camp. While we want every single one of our campers to be excited for camp to arrive, counting the days until they can be back together with their friends and family at Camp Ramah in New England, we also hope that the ten months of the year are just as vibrant a Jewish experience for our kids as was their time at camp. Korach: Challenge Authority for Heaven’s Sake!